The period covered by Arts:Search 1916- 1917,1921-1922. Available soon. 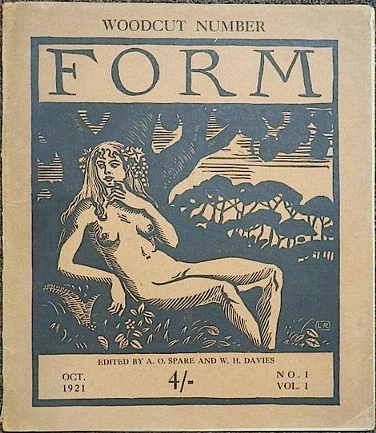 Form was conceived by the extraordinary English artist and occultist Austin Osman Spare (1886-1956) and launched at the height of the First World War. Spare envisaged it as a successor to The Yellow Book, however, it proved nowhere near as successful, running to only 5 issues – April 1916, April 1917, October 1921 November/December 1921, and January 1922. However, during its short history Form was able to muster some notable contributors including Edmund J. Sullivan, Harold Massingham, Aldous Huxley, Robert Graves, Walter Sickert, Arnold Bennett, Siegfried Sassoom, Edward Thomas, James Guthrie, W.H. Davies, Arthur Waley, Edith Sitwell, Frank Brangwyn, Laura Knight, Sidney Sime, Ludovic Rodo, Edward Wadsworth, Walter Spradbury, William Nicholson, Claude Lovat Fraser, John Nash and Paul Nash.